No laboratory studies have been shown to definitively help with the differential diagnosis of abruptio placentae; however, multiple laboratory studies may be helpful in the management of this problem. A complete blood cell (CBC) count can help to determine the patient's current hemodynamic status, but findings are not reliable for estimating acute blood loss. In an acute hemorrhage, the fall in hematocrit value lags several hours behind the bleeding and may be falsely decreased by the administration of crystalloid fluids during resuscitation. Pregnancy is associated with hyperfibrinogenemia; therefore, modestly depressed fibrinogen levels may represent significant coagulopathy. A fibrinogen level of less than 200 mg/dL suggests that the patient has a severe abruption. The goal should be to keep the fibrinogen level above 100 mg/dL, which can be accomplished via transfusion of fresh frozen plasma or cryoprecipitate, as necessary. Some form of disseminated intravascular coagulation (DIC) is present in up to 20% of patients with severe abruptions. Because many of these patients require cesarean delivery, knowing a patient's coagulation status is imperative. The hypovolemic condition brought on by a significant abruption also affects renal function. The condition usually self-corrects without significant residual dysfunction, if fluid resuscitation is timely and adequate. The patient should have her blood typed and at least 2 units of packed red blood cells crossmatched in the event she requires a transfusion. The blood Rh type is important to determine, because patients who are Rh-negative require Rh immune globulin to prevent isoimmunization, which could affect future pregnancies. Findings help to detect fetal red blood cells in the maternal circulation. If the abruption is significant, inadvertent transfusion of fetal blood into the maternal circulation may occur. In women who are Rh-negative, this fetal-to-maternal transfusion may lead to isoimmunization of the mother to Rh factor. Kleihauer-Betke test findings help to determine the volume of fetal blood transfused into the maternal circulation. All patients who are D-negative should receive Rho (D) immune globulin (RhoGAM) after significant trauma. Kleihauer-Betke test findings may help to determine the appropriate dosage of Rho (D) immune globulin in cases of significant fetal-maternal hemorrhage. Ultrasonography is a readily available and important imaging modality for assessing bleeding in pregnancy. The quality and sensitivity of ultrasonography in detecting placental abruptions has improved significantly; however, it is not a sensitive modality for this purpose—findings are positive in only 25% of cases confirmed at delivery, and the negative predictive value is low at around 50%. In addition, there does not appear to be any clinical difference in presentation between women who have an abruption seen on ultrasonography and those who do not. Placental abruption shows as a retroplacental clot on an ultrasonographic image, but not all abruptions are ultrasonographically detectable. In the acute phase, a hemorrhage is generally hyperechoic, or even isoechoic, compared with the placenta; a hemorrhage does not become hypoechoic for nearly a week. Ultrasonography can help to exclude other causes of third-trimester bleeding. Possible findings consistent with an abruption include (1) retroplacental clot (ie, hyperechoic to isoechoic in the acute phase, changing to hypoechoic within a wk), (2) concealed hemorrhage, or (3) expanding hemorrhage. 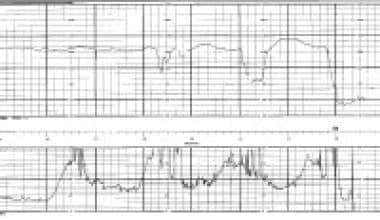 External fetal monitors often reveal fetal distress, as evidenced by late decelerations, fetal bradycardia, or decreased beat-to-beat variability. An increase in the uterine resting tone may also be noticed, along with frequent contractions that may progress to uterine hyperstimulation, as seen in the fetal tracing below. Fetal tracing with placental abruption. Decreased short-term variability, increased baseline uterine tone, uterine hyperstimulation, and worsening variable decelerations. A biophysical profile (BPP) can be used to help evaluate patients with chronic abruptions who are being managed conservatively. A BPP score of less than 6 (maximum of 10) may be an early sign of fetal compromise. A modified BPP (nonstress test with amniotic fluid index) is sometimes used for monitoring in this situation. Any procedures that may be required (ie, continuous monitoring of the fetal heart rate tracing, vaginal delivery, cesarean delivery) will be dictated by the gestational age and overall status of the fetus. This is discussed in more detail below. After delivery of the placenta, a retroplacental clot may be noted. Another possible finding involves extravasation of blood into the myometrium, which produces a purple discoloration of the uterine serosa. This phenomenon is known as a Couvelaire uterus. Abu-Heija A, al-Chalabi H, el-Iloubani N. Abruptio placentae: risk factors and perinatal outcome. J Obstet Gynaecol Res. 1998 Apr. 24(2):141-4. [Medline]. Oyelese Y, Ananth CV. Placental abruption. Obstet Gynecol. 2006 Oct. 108(4):1005-16. Workalemahu T, Enquobahrie DA, Gelaye B, Thornton TA, Tekola-Ayele F, Sanchez SE, et al. Abruptio placentae risk and genetic variations in mitochondrial biogenesis and oxidative phosphorylation: replication of a candidate gene association study. Am J Obstet Gynecol. 2018 Dec. 219 (6):617.e1-617.e17. [Medline]. Ananth CV, Oyelese Y, Yeo L, Pradhan A, Vintzileos AM. Placental abruption in the United States, 1979 through 2001: temporal trends and potential determinants. Am J Obstet Gynecol. 2005 Jan. 192(1):191-8. [Medline]. Rana A, Sawhney H, Gopalan S. Abruptio placentae and chorioamnionitis-microbiological and histologic correlation. Acta Obstet Gynecol Scand. 1999 May. 78(5):363-6. [Medline]. Tuuli MG, Norman SM, Odibo AO, Macones GA, Cahill AG. Perinatal outcomes in women with subchorionic hematoma: a systematic review and meta-analysis. Obstet Gynecol. 2011 May. 117(5):1205-12. [Medline]. Ananth CV, Smulian JC, Vintzileos AM. Incidence of placental abruption in relation to cigarette smoking and hypertensive disorders during pregnancy: a meta-analysis of observational studies. Obstet Gynecol. 1999 Apr. 93(4):622-8. [Medline]. Ananth CV, Savitz DA, Luther ER. Maternal cigarette smoking as a risk factor for placental abruption, placenta previa, and uterine bleeding in pregnancy. Am J Epidemiol. 1996 Nov 1. 144(9):881-9. [Medline]. Ananth CV, Savitz DA, Bowes WA Jr, Luther ER. Influence of hypertensive disorders and cigarette smoking on placental abruption and uterine bleeding during pregnancy. Br J Obstet Gynaecol. 1997 May. 104(5):572-8. [Medline]. Hoskins IA, Friedman DM, Frieden FJ. Relationship between antepartum cocaine abuse, abnormal umbilical artery Doppler velocimetry, and placental abruption. Obstet Gynecol. 1991 Aug. 78(2):279-82. [Medline]. Tikkanen M, Nuutila M, Hiilesmaa V, Paavonen J, Ylikorkala O. Clinical presentation and risk factors of placental abruption. Acta Obstet Gynecol Scand. 2006. 85(6):700-5. [Medline]. Ananth CV, Wilcox AJ. Placental abruption and perinatal mortality in the United States. Am J Epidemiol. 2001 Feb 15. 153(4):332-7. [Medline]. Tikkanen M, Luukkaala T, Gissler M, et al. Decreasing perinatal mortality in placental abruption. Acta Obstet Gynecol Scand. 2013 Mar. 92(3):298-305. [Medline]. Raymond EG, Mills JL. Placental abruption. Maternal risk factors and associated fetal conditions. Acta Obstet Gynecol Scand. 1993 Nov. 72(8):633-9. [Medline]. Pariente G, Shoham-Vardi I, Kessous R, et al. Placental abruption as a significant risk factor for long-term cardiovascular mortality in a follow-up period of more than a decade. Paediatr Perinat Epidemiol. 2014 Jan. 28(1):32-8. [Medline]. Clark SL. Placentae previa and abruptio placentae. Creasy RK, Resnik R, eds. Maternal Fetal Medicine. 5th ed. Philadelphia, Pa: WB Saunders; 2004. 715. Glantz C, Purnell L. Clinical utility of sonography in the diagnosis and treatment of placental abruption. J Ultrasound Med. 2002 Aug. 21(8):837-40. [Medline]. Kramer MS, Usher RH, Pollack R. Etiologic determinants of abruptio placentae. Obstet Gynecol. 1997 Feb. 89(2):221-6. [Medline]. Ananth CV, Wapner RJ, Ananth S, DʼAlton ME, Vintzileos AM. First-Trimester and Second-Trimester Maternal Serum Biomarkers as Predictors of Placental Abruption. Obstet Gynecol. 2017 Mar. 129 (3):465-472. [Medline]. ACOG Committee Opinion. Antenatal Corticosteroid Therapy for Fetal Maturation. ACOG. Available at https://www.acog.org/-/media/Committee-Opinions/Committee-on-Obstetric-Practice/co677.pdf?dmc=1&ts=20160922T2345049022. Number 677, October 2016; Accessed: November 23, 2016. Meguerdichian D. Complications in late pregnancy. Emerg Med Clin North Am. 2012 Nov. 30(4):919-36. [Medline]. Schmidt P, Raines DA. Placental Abruption (Abruptio Placentae). 2018 Jan. [Medline]. [Full Text]. Placental abruption seen after delivery. The authors and editors of Medscape Reference gratefully acknowledge the contributions of previous author Andrew Satin, MD, to the development and writing of the source article.